Bracken is a very small Lines Sportiboy horse. He has been restored as a bay with 3 white socks , black legs and some black dappling. 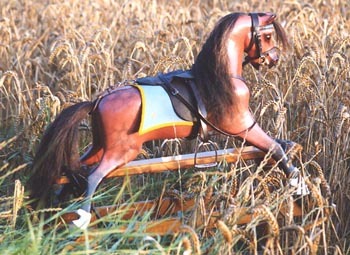 Bay horses were made by Lines and some other makers but they are rare and hard to find in original condition now. 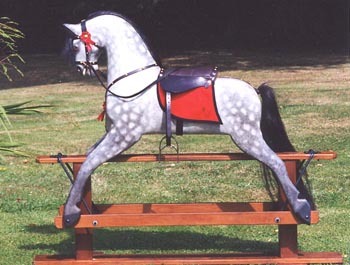 DC is a large Collinson horse, made about 1965. 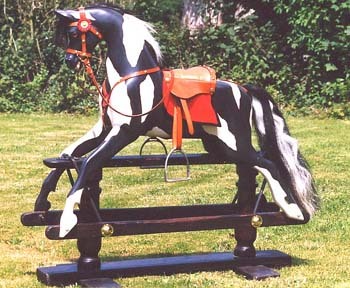 He needed restoration and his owner and I thought that a more natural dapple might be nice: not authentic for Collinson horses but he can always be repainted again if wanted. This horse is a lovely old Lines horse. He had been overpainted many times in his life and his owners wanted him to be a piebald for the time being. Great fun to paint ( done in 2002).